It’s the Most Wonderful Time of the Year as far as I am concerned – fish fry season. Cod, haddock, perch, walleye – what’s not to like? Pillows of beer battered fish served with sides of pierogis, chowder, cole slaw, mac n cheese, etc. Some fish fries go all out with baked fish, shrimp, mussels, etc. I embraced the idea after reading Tom’s fish fry experiences in his blog, Exploring Food My Way. He’s not eating battered fish or salt or butter anymore, so I am going to pick up the torch. Cleveland embraces the fish fry. 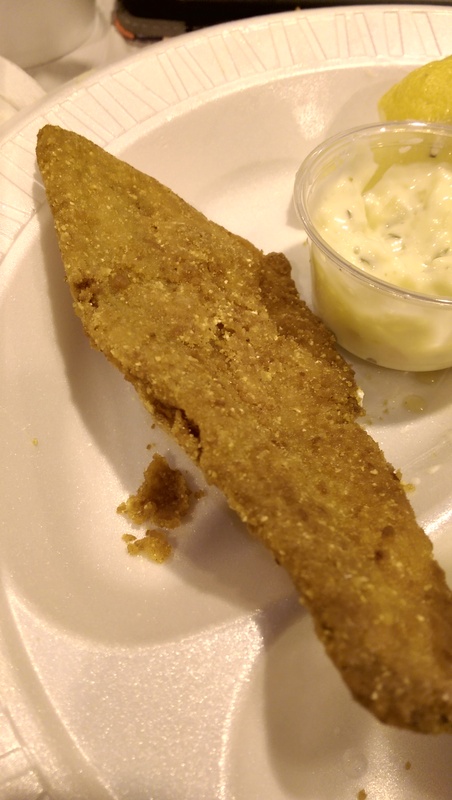 We have somehow managed to hold on to the Friday fish fry tradition — yes, in churches, but also in bars and restaurants — when most other parts of the country have not. I decided to document my visits to local fish fries this year. Since most church fish fries tend to be disappointing (long lines, steam tables that make crisp fish soggy, etc.) I decided this year to choose three church fish fries and three restaurant fish fries, trying to balance it out. My favorite fish fries serve pierogi, and that is one of the qualifications I try to look for. Fish Fry Friday #1 was not very successful. I wanted to stay close to home for the first one, so when I got out of my massage at 5:30 I knew my first choice Sts. Constantine and Helen wasn’t going to be an option. The Sts. Constantine and Helen fish fry runs from 5-8, and, with just a small parking lot and parking on the side streets, parking can be a nightmare – especially smack dab in the middle of dinner service at 6:00. I decided to keep driving and go to St. Clare’s, which was serving from 4-7. I have been to St. Clare’s at the corner of Green and Mayfield in the past and enjoyed it. 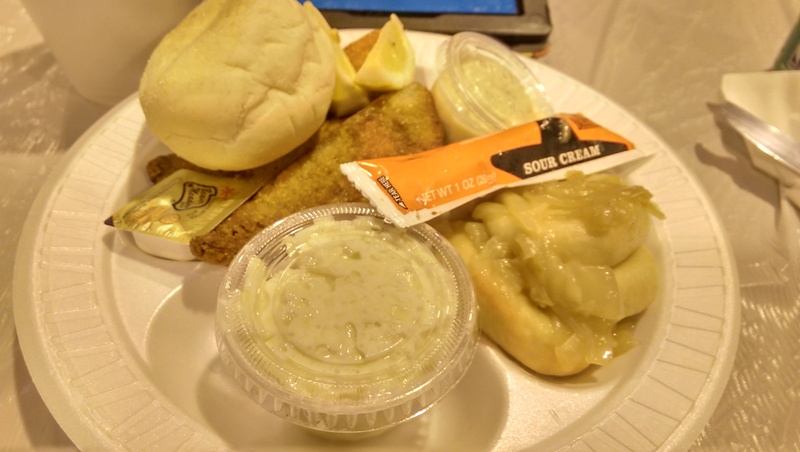 The fish fry is run by Boy Scout Troop 433, and the proceeds benefit their local troop. Troop 433 has been part of Saint Clare Church since 1955. The first time I went I remember being absolutely confused about where to go. Luckily, this time I knew to drive all the way to the back and go into the back building and not one of the church buildings. They have learned from the long lines and now swing the cash table to the right. You are then seated by one of the Scouts, who notes your table and runs the order to the kitchen. I ordered the perch dinner, which was $14 and comes with two sides. They also offer fried or baked fish for $11, fried shrimp for $11, pasta with no side for $8.50, 6 pierogi with one side for $8.50, or a fish sandwich for $7. The side choices were french fries, Sophie’s pierogi, cole slaw, mac n cheese, cabbage and noodles and applesauce. 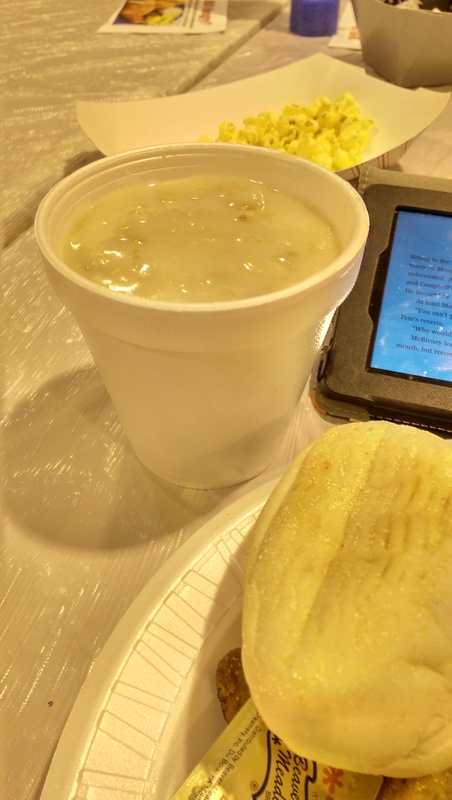 I also ordered a bowl of clam chowder for $4 (a cup will run you $2). The cashier asked if I wanted onions with my pierogis, and I was on my way. I came towards the end of their evening, so there was no line at all and quite a few empty tables. I sat at a completely empty table. There were also quite a few people sitting off to the side waiting for their fish fries to go. 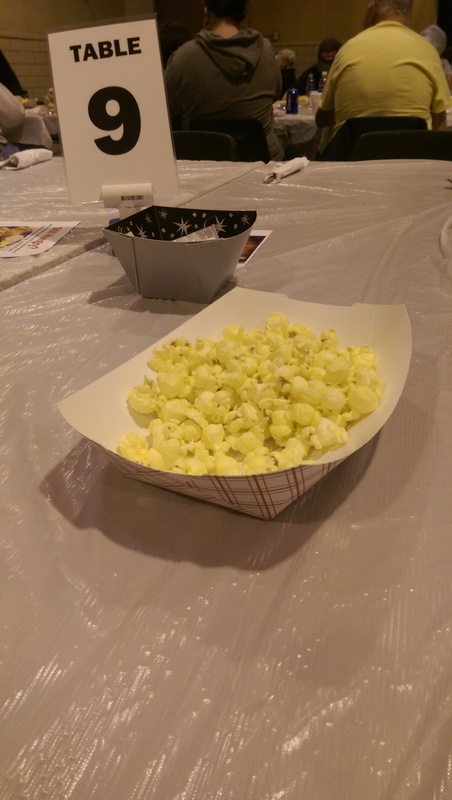 The wait was a little long, but they had a cardboard container of buttered popcorn to stave off the hunger. I grabbed a couple cans of soda, which is available along with water for $1. I finished the first one while I waited. I brought my Kindle, so I was perfectly happy with the wait. I think my food came out in about 20-30 minutes. Let’s talk about the food. Everyone raves about Lake Erie perch at fish fries. Save your money here and get the basic fried fish, which looked good when the tables around me got them. The perch I was served were fish briquettes. Dried out slabs of breading and desiccated fish. I give them a D and I’m being generous. The roll and cole slaw were food service and passable. The pierogi were the highlight, but I only give them a B+ because they weren’t pan fried to finish. The onions were great, so I definitely enjoyed the pierogi. And they were pillowy and well-cooked. They serve Sophie’s Pierogi, so I knew what I was getting ahead of time. The clam chowder was chock-full of clams. It was a little metallic, but I enjoyed it. I didn’t enjoy the indigestion that night though. Who knows what caused it, but I want to be honest about my experiences here. I do want to reiterate that I have been here before and had a lovely experience – enough that I wanted to come back, so your experience could be completely different (but avoid the perch). I left feeling good about supporting the Boy Scouts, but went to Arthur Treacher’s the next day for some pillowy fried fish to satisfy my craving. So yeah. 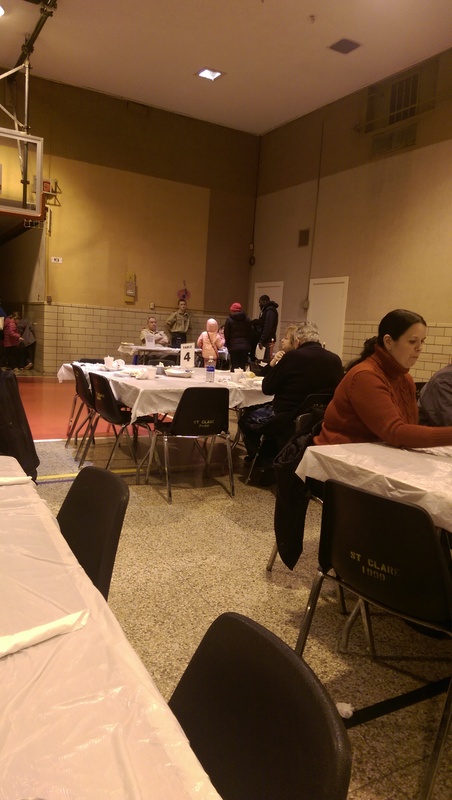 Next week is my favorite fish fry in Cleveland – St. Gabriel’s in Mentor! Cleveland Rocks, Cleveland Eats Create a free website or blog at WordPress.com.